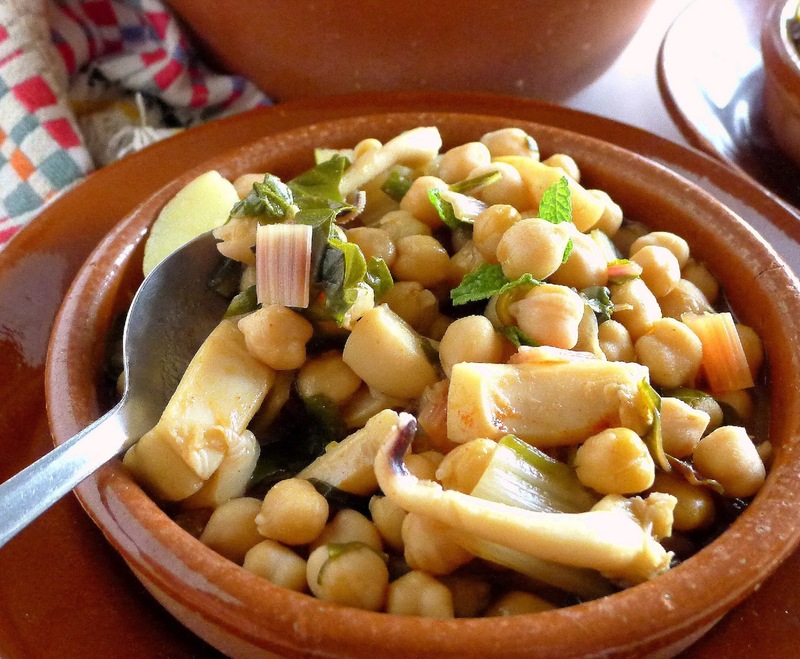 I am all about traditional Spanish cooking, home cooking, which, although often inspired, is seldom fancy. Variations on family dishes are legion, with every housewife adapting recipes to availability, but innovations are few. 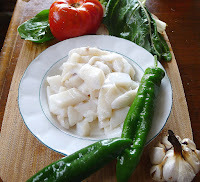 No one would dream of putting basil or chile into gazpacho, let alone of making a jellied variation with shrimp or turning it into ice cream or foam or smoke. But, sometimes even the tried and true needs a little tweaking, just for fun. 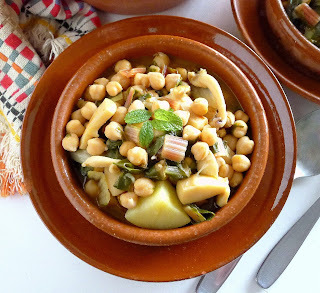 So after I decided on a very traditional Málaga recipe to make this week—potaje de jibia con garbanzos—cuttlefish and chickpea stew, a traditional dish for Lenten meals in which cuttlefish takes the place of the meat and sausage in typical legume stews —I dreamed up some variations to jazz it up a bit. A traditional Lenten stew with chunks of cuttlefish, chickpeas, chard and potatoes. Same potaje with the addition of shrimp and an inky alioli sauce. I served the original stew in small portions molded in a disc and embellished them with a garlicky alioli sauce colored black with cuttlefish ink. The kids thought it was a hoot. I loved the way it looked—right up until I stirred the inky sauce into the chickpea stew, turning it a weird grey! See what you think. Same stew, jazzed up. Serve it as a starter. Put the chickpeas to soak a day before cooking the stew. Char-roast the head of garlic over a gas flame or under the broiler until blackened. 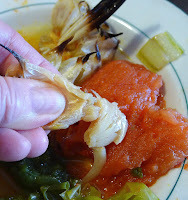 Rub off outer skin, but leave the head of garlic whole to make it easier to remove from the stew later. 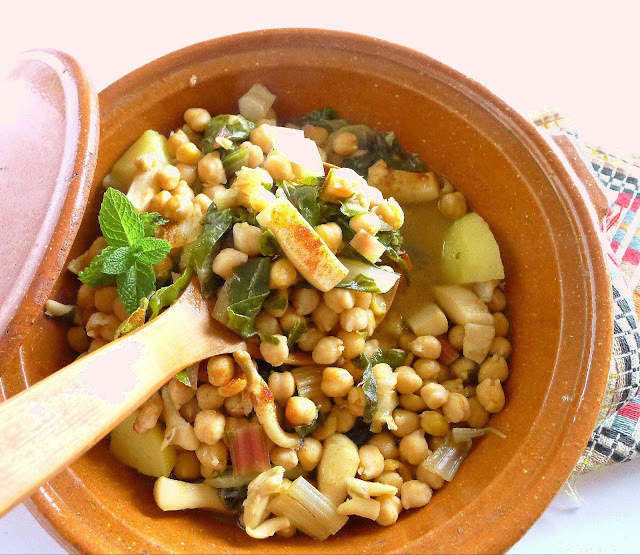 The day before cooking the stew, put the chickpeas in a large bowl and cover with hot water to 1 ½ their depth. Soak overnight. Add the cut-up cuttlefish, the whole head of garlic, green pepper and whole tomato. Mix the pimentón and cumin with the oil and stir into the pot. Bring to a boil, then simmer, covered, 40 minutes. Squeeze pulp from garlic cloves. Use a skimmer or slotted spoon to remove the onion, garlic, pepper and tomato. Discard the cloves and put the onion in a blender. Slip skins off of the pepper and tomato and place them in the blender. Squeeze the garlic cloves into the blender. Blend the vegetables, adding a little liquid from the pot, as needed. Stir the blender mixture back into the pot. Add the chard and potatoes. Bring again to a boil, reduce heat and cook, uncovered, until potatoes and chard are tender, about 20 minutes. Allow the stew to settle 5 minutes before serving with a sprig of mint in each bowl. 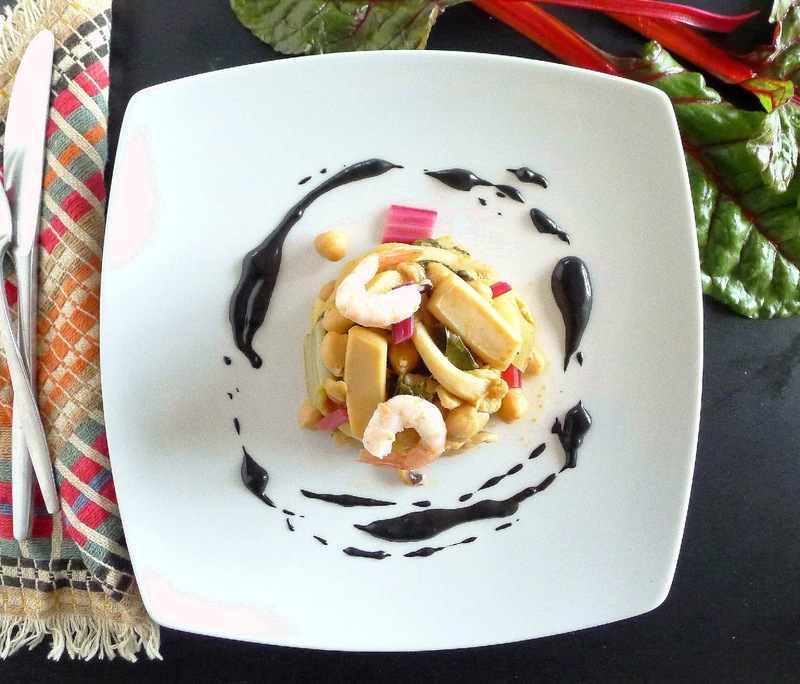 Use ink sacs from fresh cuttlefish or packets of frozen cuttlefish ink to color the sauce. Ask your fish vendor for the packets of ink or look for them in the frozen foods section. 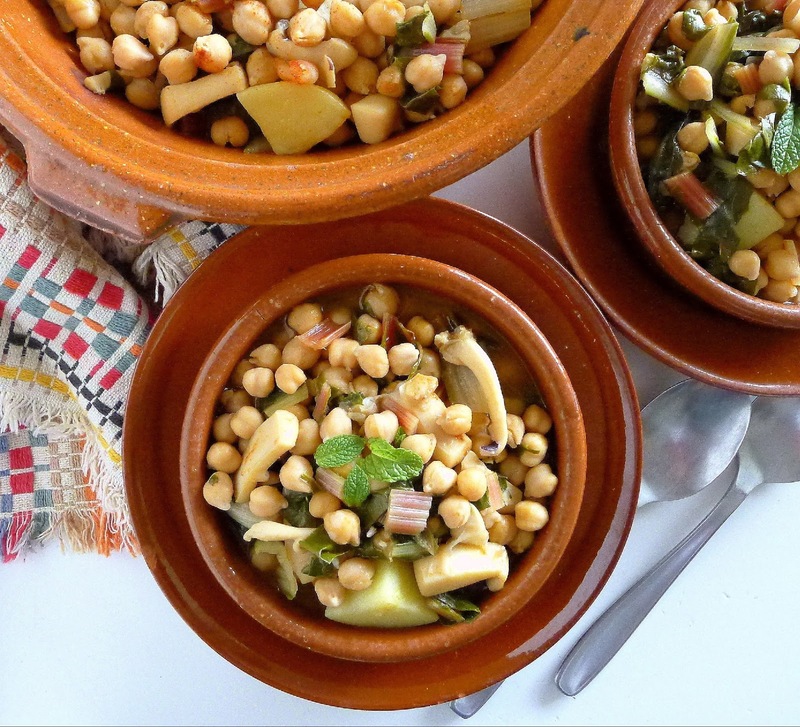 Make the stew as in the preceding recipe, using rainbow chard. 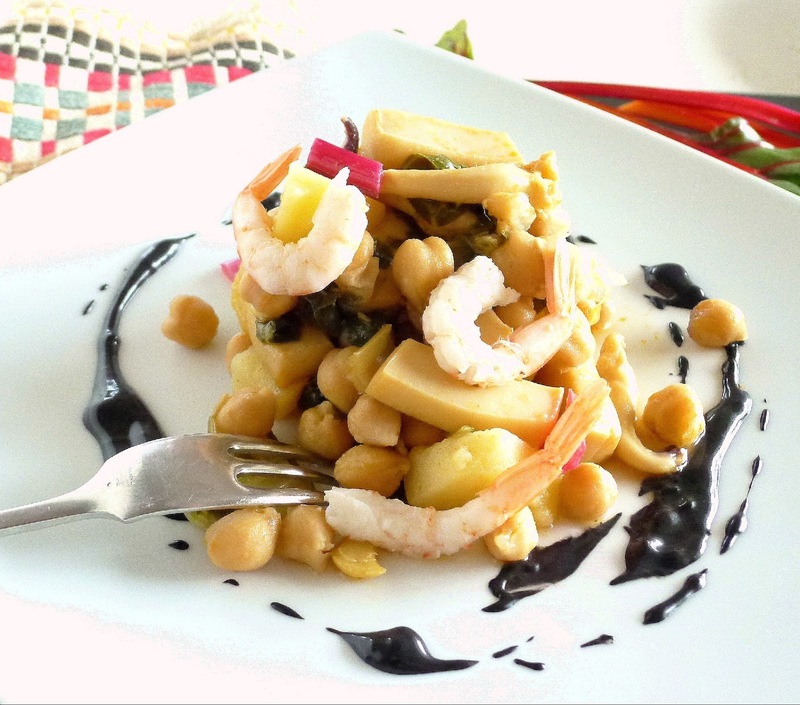 Use a slotted spoon to separate 6 cups of the cuttlefish, chickpeas and vegetables. Drain off as much of the liquid as possible. Place a small ring mold on a plate. 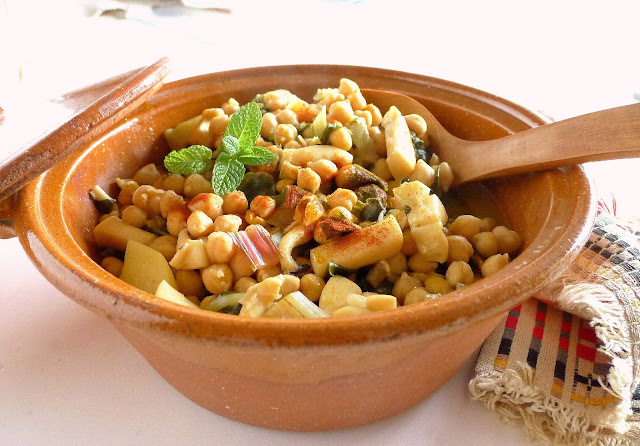 Fill it with about 1 cup of the cuttlefish and chickpeas, pressing down slightly to pack the mixture. Blot any liquid that runs off with paper towels. Carefully lift off the ring. Continue to mold the remaining 5 servings. Place 3 cooked shrimp on top of each mound. 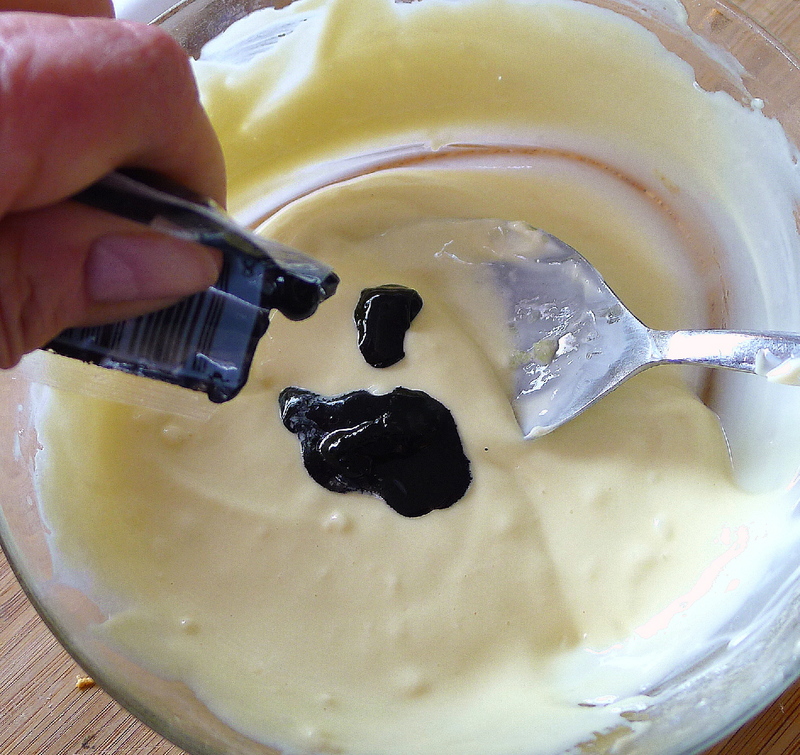 Make the ink sauce. Stir the mayonnaise until smooth. Add the garlic. Beat in the oil little by little so the sauce emulsifies. Stir in the lemon juice. 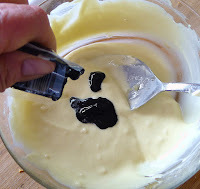 Squeeze cuttlefish ink into the sauce and stir. Use a spoon to dribble and trail the sauce around the mound of chickpea and cuttlefish stew. Serve room temperature. David: And, it was delicious, right? 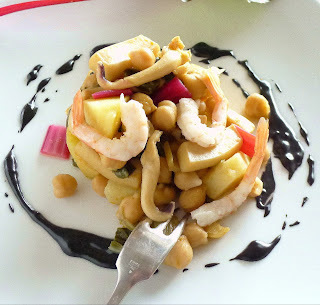 I remember when I was a teenager, my parents came back from a trip to Spain and told me they ate "squid in its own ink." I was grossed out. Or-- maybe that's what got me interested in Spanish cooking.